PARIS – Why does no one challenge the Deep State? In this era of business-suit machismo, why does no presidential candidate propose kicking the biggest, softest butts – the ones that most need kicking? Wars? Okay with me… but not if you can’t win ‘em. We paid $1 trillion to the people who were supposed to be fighting the War on Drugs. It hasn’t worked. Drugs are as plentiful and as easy to buy today as when the war began back in 1970. We paid more than $1.6 trillion to fight terrorism and more than $2 trillion for the war in Iraq. Our boys may have done a good job out in the field, but the brass has totally failed. When the war began we faced only a few hundred fanatics. You could have put them all on a luxury cruise ship… and never brought them back. Now, there are hundreds of thousands… maybe millions… of terrorists – some right here in the U.S.
Our leaders told us that drones, boots on the ground, and bombing would lead to peace and stability. Instead, they’ve done the opposite. My message to the strategists, generals, and war profiteers: You’re all fired! And how many times have we heard from politicians that we need to “help our hardworking families”? That is supposedly why, since 2009, we have transferred $10 trillion or more to Wall Street to fight this war on the business cycle. The money was supposed to “trickle down.” Well, it didn’t. It stayed with the richest people in the country. And get this… we’ve spent $22 trillion on the War on Poverty since 1964. We had 10% below the poverty line then. Guess how many are below the poverty line today? 10%. It was almost as if they didn’t want to win. I’d fire the bureaucrats responsible for it. And all you Deep State lobbyists, hacks, hangers on, chiselers, zombies, cronies, and connivers: You’re all fired, too. We’re taking back the U.S. government! America’s middle class has shrunk to just half the population for the first time in at least four decades, as the forces of technological change and globalization drive a wedge between the winners and losers in a splintering U.S. society. 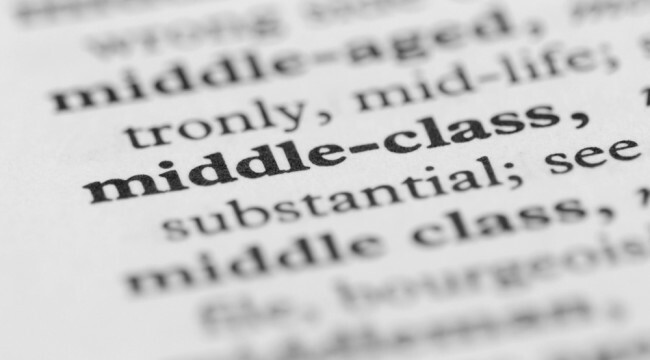 The ranks of the middle class are now narrowly outnumbered by those in lower and upper income strata combined for the first time since at least the early 1970s. Typically, the FT got the facts right but missed the point. Technological change? Globalization? No one’s fault? Who provided U.S. tech companies and Chinese manufacturers with almost unlimited cheap funding? Who cheated middle-class savers with zero interest rates? Who gummed up the U.S. economy with thousands of rules, regulations, and red tape – making it hard to start a new business? Whose cheap money financialized the economy, shrinking the high-wage manufacturing sector while favoring low-wage service industries? Who really squeezed the middle class? Mexicans? Muslims? Or Deep State cronies? But wait… take a deep breath. It’s Friday. We take it easy on Friday. Besides, who do we think we are? We’re observers, not fixers. And what we observe is that no candidate – except Ron Paul, who never posed a serious threat – has ever challenged the Deep State. “The Sandinistas did some good things and some very bad things,” said Antonio. We were racing along dirt roads near the Pacific coast. Antonio – a boss in this part of Nicaragua – was pointing out the big ranches that the Sandinistas had confiscated. Now, landowners are getting their property back – or compensation. But it is a long, hard process. The land may have been sold several times since the early 1980s. It will take years to sort out the mess in the land registry records. Americans would be considerably richer if they didn’t give up so much of their income to the government. “But one of the good things the Communists did was to make people appreciate a good boss,” he continued. Longtime readers are familiar with the winding roads we sometimes take. But it is a rare road that doesn’t lead somewhere. Not always where we intended to go… but often where we should have been. Antonio employs hundreds of local men and women – building roads, building houses, tending cattle, cooking breakfast, doing laundry. He has teams of workers with machetes who cut the tall grass in the rainy season. “Wouldn’t it be better to use a tractor with a bush hog?” I ask. “Well, maybe, but this way gives people work,” comes the reply. “At least you could give them scythes, so they didn’t have to bend over so much,” I suggest. Antonio’s family once owned 100,000 acres of cattle land in southwest Nicaragua. Now, he spends a good deal of his time trying to get the land back. It is a tropical paradise along the Pacific coast. But nature rarely gives something without taking something away. Tidal waves, earthquakes, and volcanic eruptions have all left their mark. In 1972, an earthquake leveled the capital, Managua. It killed more than 6,000 people, injured another 20,000, and left another 250,000 homeless. The nearby town of Masaya was also hit – it has many houses with collapsed roofs and walls still waiting to be repaired a decade later. And in the early 1990s, a tidal wave swept away Antonio’s grandfather’s house – located just a few feet from our lodge. There are also dangerous bugs. My wife is a healthy woman. But when I found her unconscious on the bathroom floor, with her eyes rolled back in her head and foam coming out of her mouth, I knew that something about Nicaragua did not agree with her. Antonio drove his pickup down the narrow dirt road as though he were trying to outrun a tornado. Storms of dust followed us, choking the poor campesinos walking along the roadside… and covering the schoolchildren in their bright white and blue uniforms. He rarely slowed – for cows, chickens… or even humans. Instead, he just tooted his horn and counted on the survival instinct of his fellow mammals to keep them out of his way. “You know, another good thing the Sandinistas did? They made people poor. Rich people can afford to be Communists. But people in Nicaragua began to see themselves getting poorer and poorer as their relatives in Miami and Costa Rica were getting richer. Antonio is helping to answer one of the most puzzling questions of our time: Why has the level of government spending continued to rise in the U.S.? Government is an economic deadweight. It is a cost… a net consumer of capital… a black hole into which wealth disappears. Since the fall of the Berlin Wall, there has been less need for defense spending in the U.S. And with the full-employment economic boom of the 1980s and 1990s, there is less need for social spending. But taxes and government spending continue to rise. Why? Antonio is right: Americans would be considerably richer if they didn’t give up so much of their income to government. But it is not absolute wealth that matters; it is relative wealth. We drove through a small village. Looking into the houses through open doorways, I could see the simplicity and poverty in which many of the people of Nicaragua live. Their houses often scarcely have walls – just rude boards nailed onto posts. Nor do they have much furniture – little more than a hammock and a rocking chair. But what do they need? They have a tin roof over their heads… and chickens and pigs running around the yard. Occasionally, there is fish, too, taken right out of the ocean with a simple hook and line. They don’t even need fishing rods; the hooks are swung around and tossed into the sea, with the line wrapped around a short board as it is trolled in. Some kind of festival was under way in the village. Several men were mounted on horseback, with a few dozen cheerful onlookers standing by the road. In the middle of the road, overhead, a chicken was tied to a rope stretched between two trees. “Is the chicken alive?” I asked, wondering what the SPCA might think. The sight of the happy, well-fed villagers enjoying their sport reminds us how little we really need to be happy. Just food, clothing, shelter. And a chicken that is smart enough to escape Antonio’s truck. Everything else is vanity – little more than an attempt to feel that we are better than others (or at least to avoid allowing other people to feel superior to us). There are a lot of ways to feel superior, but today we gauge our superiority in dollars and sense. Nicaraguans can’t afford more government, because they are poorer than their neighbors. But Americans are rolling in credit (which they confuse with real money). And they don’t mind giving up some of it to leaders who promise to tie up their enemies… and wrench their necks off.